A significant god of the Aztec was Mictlāntēcutli. His name means ‘Lord of Mictlan’ in Nahuatl, the language of the Aztec. In Aztec religious beliefs, Mictlāntēcutli was considered to be the god of the dead and king of the northernmost section of the underworld. He is often represented as a skeleton with eyeballs. As well, he wore a headdress made of owl feathers and a necklace of human eyeballs. It was common for gods in Aztec mythology to be represented by skeletons as its symbolized the connection between life and death for the Aztec people. When an Aztec person died they were often buried with different objects which were said to help them on their journey to the underworld. In fact, the objects were supposed to be given to Mictlāntēcutli upon their arrival to the underworld. 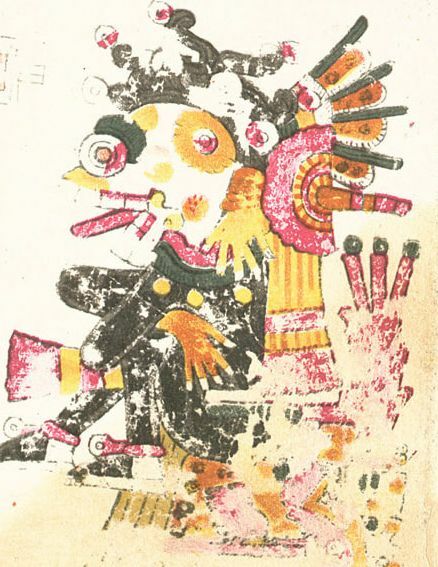 Mictlantecuhtli from the Codex Borgia. 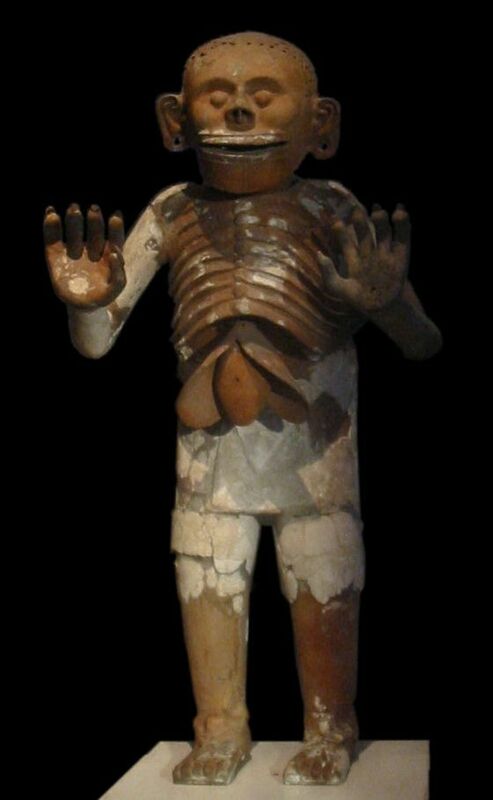 Mictlantecuhtli artwork found in the ruins of Templo Mayor in Tenochtitlan. Mictlāntēcutli is also important to Aztec mythology in that he played an important role in the creation story of human beings. For example, in the story, Quetzalcoatl is sent into the underworld to gather the bones of previous generations of gods. As the story goes, Mictlāntēcutli tried to stop Quetzalcoatl from fleeing with the bones and caused him to trip and fall. This led to Quetzalcoatl dropping the bones and they were broken into many small pieces. Quetzalcoatl picked them up and returned to the land of the living where the bones were transformed into human beings.